I felt the urge to rewrite my introduction so I thought I’d use it as a starting point for a Subscription Meme, as I haven’t seen one going around for a while. 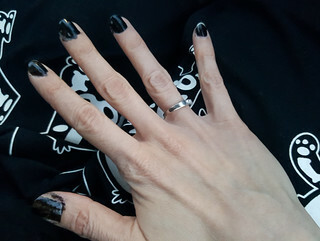 the weather today is join! please! 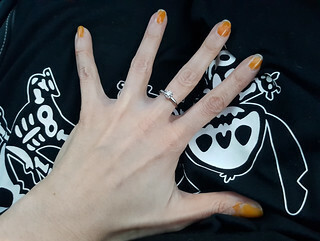 I'm finding it increasingly difficult to post given how long it's been since I last posted publicly. I miss posting every day. It also doesn't help that we're on holiday in rural Norfolk where the internet speeds are generally terrible no matter what method you use, so even uploading one photo is a tooth-grindingly tedious affair. And since I'm on holiday, the weather is good, and I brought my dSLR and favourite lenses, I'm taking a looooot of photos. Therefore, I'm going to cheat and post the same photo I posted to a community, because it took so flippin' long to get it on Flickr. 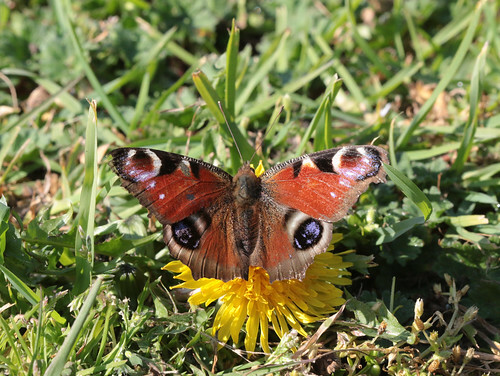 The warm weather has seen the overwintering imagos emerge from their hiding places. Keiki and Humuhumu found this peacock (butterfly) on the lawn, soaking up the sun and sipping from the daisies. We also found a tatty comma and a bright brimstone. There are a great many freshly hatched cabbage whites, orange tips and holly blues battling feistily over the burdock flowers. I was pleased to hear the distinctive call of a cuckoo, which was a comfort given that their numbers have been declining for many years, though we haven't managed to spot it yet. For the past 3-4 years, the bloke has been traveling to cities around the world as part of his air quality/particulate monitoring work. 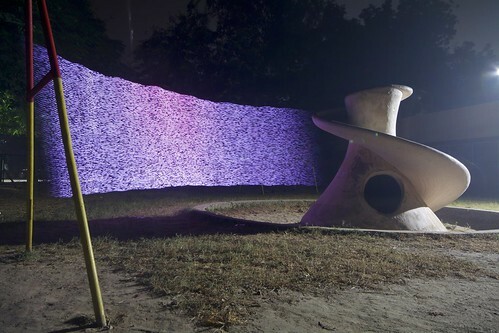 He’s often been accompanied by Robin Price, physicist and visual artist, who makes pollution paintings with a portable sensor setup. The Arts Council recently purchased the “Air of the Anthropocene” collection, and today The Guardian newspaper ran a piece about his work. Sadly, the prettier the photos are, the dirtier the air is! 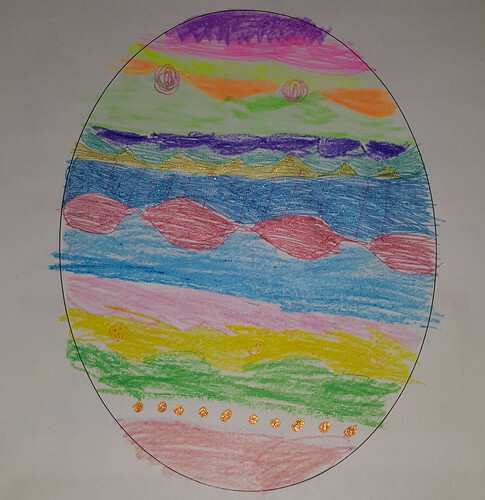 On Sunday, Humuhumu coloured in an Easter egg for a school art competition. I thought it was pretty fantastic. She also sang at a Mothering Sunday church service with her Rainbows troupe, and read out a message she wrote to me, saying “I love my mum because she is nice to me and gives me cuddles.” Something may have gotten into my eye at that point. 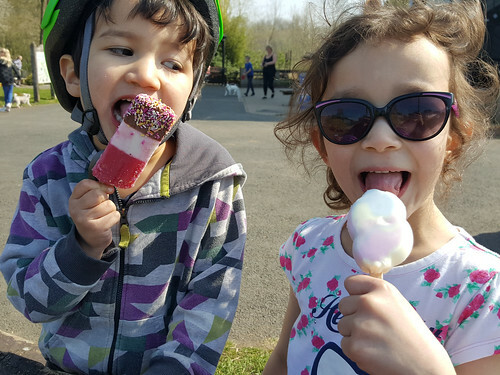 On Saturday, we went to the park to ride bicycles and eat ice creams. MiniPony was looking particularly fetching this morning. 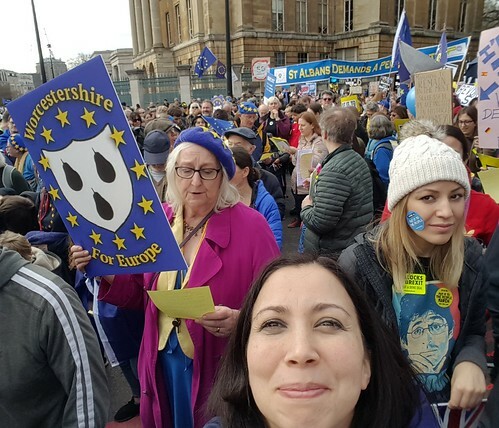 On Saturday, I went to London to march with rather a lot of people who are a bit cross about Brexit. 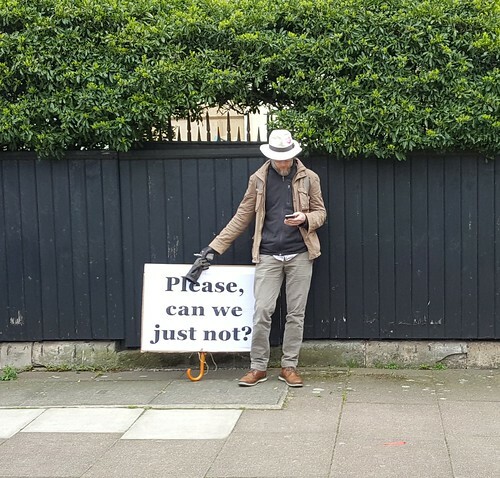 I hereby declare this to be the Best Sign of the People's Vote March: "Please, can we just not?" The umbrella handle, y'all. I believe these questions were meant to be St Patrick's Day themed. Have you ever made corned beef and cabbage? One of my grandmothers was half Irish so I have Irish heritage, although I don't believe you would ever guess that by looking at me. I helped that grandmother make corned beef and cabbage on a weekly basis, decades ago, but I don’t think I ever chose to cook it as an adult. I didn’t mind it as a child. However, it does not go with our generally light-on-the-meat menu rota for home cooking these days. Will you be tipping back a decent pint of Guinness this weekend? Since I’m doing this late: as of last weekend, no. I had gin, wine and ale (not at the same time). I also don’t plan to have Guinness this coming weekend. I do like stout, but I find it very heavy to drink so I don't often opt for it. Do you own an Irish wool sweater? Have you ever ‘met’ the Tart with a cart (i.e. have you been to Dublin)? I have been to Dublin several times in my life, most recently on a mini-break with Humuhumu and seismic. Entries on Dublin running back to 2005 can be viewed here for DW, here for LJ. Do you know what tractors, submarines and ejector seat all have in common? Well, I assumed something Irish, perhaps inventors of, or first tested by, but Wikipedia claims the ejector seat was first properly tested by a Romanian so either something has gone wrong here factually or there is a joke I'm not getting (always possible). It has been too long since the last Shaggy Pony update. In fact, it has been so long that What, the daughter of Cousin It (pictured, left), has gone off to live with new owners. 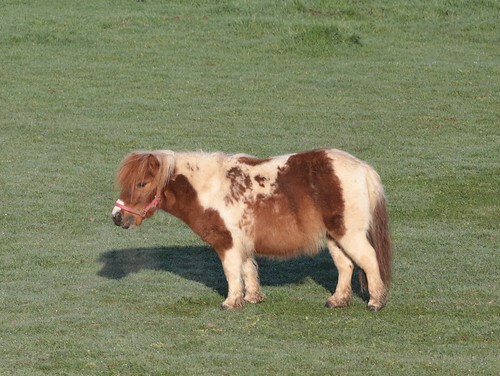 The sadness thus incurred by neighbouring observers has been mitigated by the arrival of the new resident on the right, the small and perfectly formed Miniature Pony. 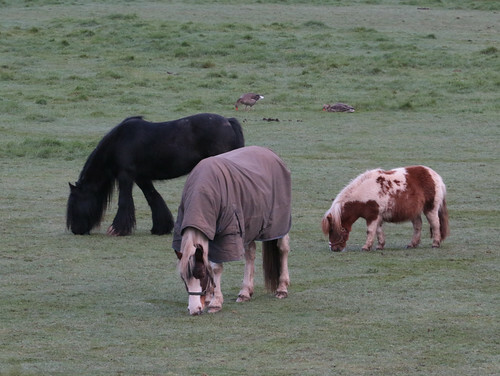 MiniPony was kept separate from the other ponies for a few weeks after its arrival, but as of last weekend, it has been allowed out to play with the other, bigger Shaggy Ponies. HUZZAH. 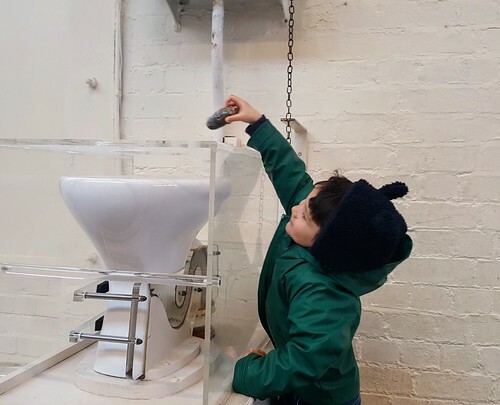 On Saturday, Keiki experienced what would appear to be the most enjoyable activity for a four-year-old. 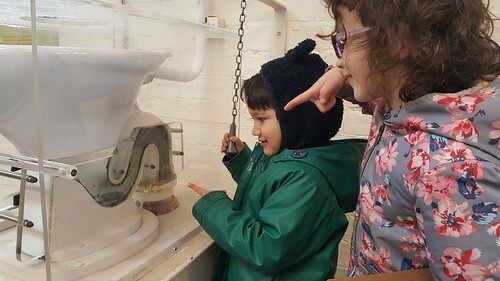 We went to Abbey Pumping Station at Leicester, where they have a setup of a cutaway toilet and the associated drainage in transparent tubes. And, of course, a pretend poo, which you can flush and then watch it take its journey to the pipes.